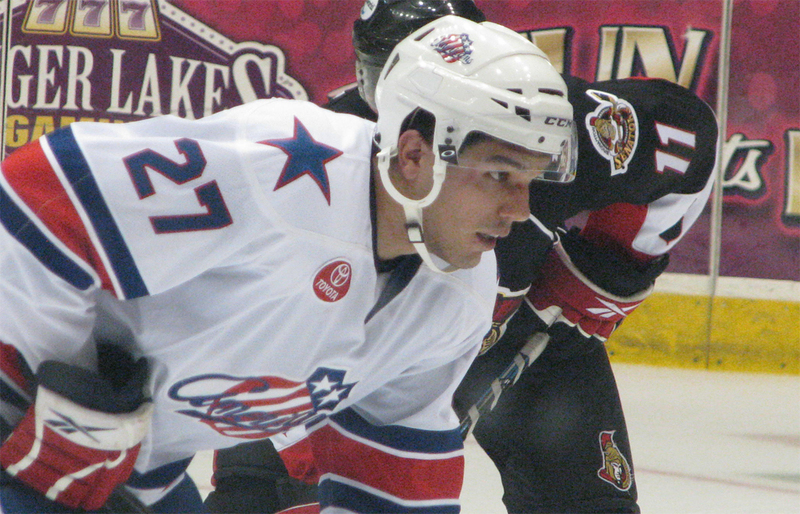 Amerks Sign Bonneau, MacIntyre to Rochester, Harvey Suspended · Let's Go Amerks! This morning I wrote about the Amerks making the right decision bringing Jimmy Bonneau back into the lineup and around the same time they must have been preparing his contract. Bonneau had signed a 25 game PTO (Professional Tryout) back on October 15th and has worked hard ever since. I had been waiting for Bonneau to get a comment for a story I’m working on but he was taking a while, so I decided to leave. That will teach me for not being patient. Bonneau has played in eight games for the Amerks and has scored one goal and tallied 54 penalty minutes. He’s a tough fighter and also skates his heart out. He gets more ice time than most enforcers which shows that the coach trusts him out on the ice. The Florida Panthers also claimed Steve MacIntyre off of waivers today from the Edmonton Oilers. MacIntyre had been signed in the summer of 2008 with the expectation he would play in Rochester. He arrived at Amerks training camp, skated for a few minutes and then learned he was claimed by the Oilers. Ever since then the Panthers have said that “Big Mac” was on their radar, I guess they weren’t lying. Update from George Richards: The Panthers immediately waived MacIntyre again with the expectations he’ll be sent to Rochester. The Edmonton Oilers have the chance to reclaim him and send him straight to Springfield. Crazy news day! Bonneau and MacIntyre in the same lineup.. could be some heavyweight bouts!! In other news Kevin Harvey has been suspended for five games following his actions in games on Friday and Saturday night. On Friday he went after Luke Beaverson with a viscious elbow that injured Beaverson and took him out of the game. Harvey was able to score off that same play and it was the turning point in the game. There was no penalty called on the play but the Amerks immediately send the video to the league for further review. The elbow triggered a four game suspension. The most absurd part about the suspension are the comments by Crunch head coach Ross Yates. 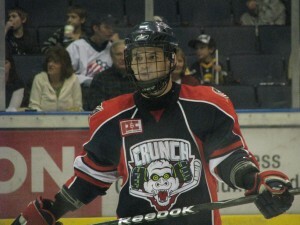 Crunch coach Ross Yates said he was “shocked” by the severity of the suspension. Coincidentally, the suspension ends right after Syracuse’s next game in Rochester, on Nov. 20. After the game Harvey didn’t seem to think he did anything wrong either. On Saturday night Harvey used his stick like a baseball bat and slashed a Mitch Fritz of the Norfolk Admirals. Here’s the video of that, watch #17 around the 7 second mark.